Spondylolisthesis describes the abnormal positioning of one vertebra in front of the vertebra below. In the picture on the left below, the arrows outlining the back of the L4 and L5 vertebra do not align. 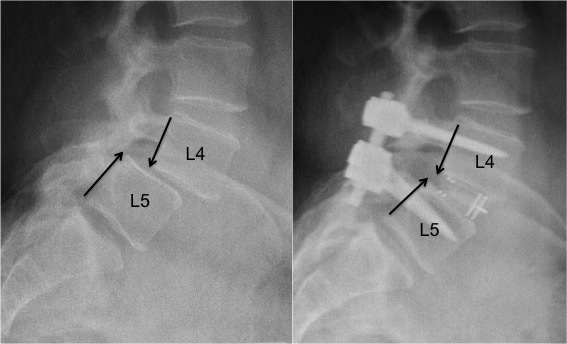 The L4 vertebra has ‘slipped forward’ in relation to L5. Among the common causes of spondylolisthesis are degeneration and spondylolysis (‘pars defects’). Spondylolisthesis may cause narrowing of the spinal canal (stenosis), narrowing around the exiting nerves (foraminal stenosis) or be associated with back pain. Xrays before (left) and after (right) surgery showing reduction of slipped vertebra (arrows aligned) after surgery with pedicle screws and interbody cages.